The earth history mapped on the geologic time scale contrasts with that mapped by young-earth creationists, which see the earth as only thousands of years old. In the geological time scale, the largest defined unit of time is the eon, which is further divided successively into eras, periods, epochs, and stages. Overlaid on this general pattern developed by geologists is a complementary mapping by paleontologists who have defined a system of faunal stages of varying lengths, based on changes in the observed fossil assemblages. In many cases, such faunal stages have been adopted in building the geologic nomenclature, though in general there are far more recognized faunal stages than defined geologic time units. Geologists tend to talk in terms of Upper/Late, Lower/Early, and Middle parts of periods and other units—for example, "Upper Jurassic", "Middle Cambrian". Because geologic units occurring at the same time but from different parts of the world can often look different and contain different fossils, there are many examples where the same period was historically given different names in different locales. For example, in North America the Early Cambrian is referred to as the Waucoban series, which is then subdivided into zones based on trilobites. The same time span is split into Tommotian, Atdabanian, and Botomian stages in East Asia and Siberia. It is a key aspect of the work of the International Commission on stratigraphy to reconcile this conflicting terminology and define universal horizons that can be used around the world. Nicholas Steno laid down the principles underlying geologic time scales in the late seventeenth century. Steno argued that rock layers (strata) are laid down in succession, and that each represents a “slice” of time. He also formulated the principle of superposition, which states that any given stratum is probably older than those above it and younger than those below it. Steno's principles were simple, but applying them to real rocks proved complex. During the eighteenth century, geologists came to realize that: 1) Sequences of strata were often eroded, distorted, tilted, or even inverted after deposition; 2) strata laid down at the same time in different areas could have entirely different appearances; and 3) the strata of any given area represented only part of the Earth's long history. The first serious attempts to formulate a geological time scale that could be applied anywhere on Earth took place in the late eighteenth century. The most influential of those early attempts (championed by Abraham Werner, among others) divided the rocks of the Earth's crust into four types: primary, secondary, tertiary, and quaternary. Each type of rock, according to the theory, formed during a specific period in Earth history. It was thus possible to speak of a "Tertiary Period" as well as of "Tertiary Rocks." Indeed, "Tertiary" and "Quaternary" remained in use as names of geological periods well into the twentieth century. The identification of strata by the fossils they contained, pioneered by William Smith, Georges Cuvier, and Alexandre Brogniart in the early nineteenth century, enabled geologists to divide Earth history more finely and precisely. It also enabled them to correlate strata across national (or even continental) boundaries. If two strata (however distant in space or different in composition) contained the same fossils, chances were good that they had been laid down at the same time. Detailed studies of the strata and fossils of Europe produced between 1820 and 1850 formed the sequence of geological periods still used today. British geologists dominated the process, and the names of the periods reflect that dominance. The "Cambrian," "Ordovician," and "Silurian" periods were named for ancient British tribes (and defined using stratigraphic sequences from Wales). The "Devonian" was named for the British county of Devon, and the name "Carboniferous" was simply an adaptation of "the Coal Measures," the old British geologists' term for the same set of strata. The "Permian," though defined using strata in Russia, was delineated and named by British geologist Roderick Murchison. When William Smith and Sir Charles Lyell first recognized that rock strata represented successive time periods, there was no way to determine what time scale they represented. 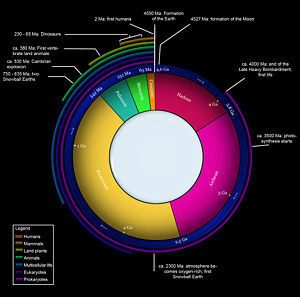 Young earth creationists proposed dates of only a few thousand years, while others suggested large (and even infinite) ages. For over one hundred years, the age of the Earth and of the rock strata was the subject of considerable debate until advances in the latter part of the twentieth century allowed radioactive dating to provide relatively firm dates to geologic horizons. In the intervening century and a half, geologists and paleontologists constructed time scales based solely on the relative positions of different strata and fossils. In 1977, the Global Commission on Stratigraphy (now the International Commission) started an effort to define global references (Global Boundary Stratotype Section and Points) for geologic periods and faunal stages. Their most recent work is described in the 2004 geologic time scale of Gradstein, Ogg, and Smith (2005), and used as the foundation of the table on this page. The tables of geologic periods presented here are in accordance with the dates and nomenclature proposed by the International Commission on Stratigraphy, and uses the standard color codes of the United States Geological Survey. An overview of the geologic time periods. The second and third timelines are each subsections of their preceding timeline as indicated by asterisks. Paleontologists often refer to faunal stages rather than geologic periods. The stage nomenclature is quite complex. The start time for the Holocene epoch is here given as 11,430 years ago ± 130 years. For further discussion of the dating of this epoch, see Holocene. These four era names were taken from Lunar geologic timescale. Their use for Earth geology is unofficial. Amthor, J. E., J. P. Grotzinger, S. Schroder, S. A. Bowring, J. Ramezani, M. W. Martin, and A. Matter. 2003. Extinction of Cloudina and Namacalathus at the Precambrian boundary in Oman. Geology 31(5):431-434. Bowring, S. A., D. H. Erwin, Y. G. Jin, M. W. Martin, K. Davidek, and W. Wang. 1998. U/Pb zircon geochronology and tempo of the end-Permian mass extinction. Science 280 (5366):1039-1045. Gradstein, F. M., J. G. Ogg, and A. G. Smith. 2005. A Geologic Time Scale 2004. Cambridge: Cambridge University Press. History of "Geologic time scale"
This page was last modified on 21 April 2015, at 14:44.